Emma Bocanegra’s soccer horizons are heading due south — all the way to South America, to play for the Peruvian national women’s soccer team. 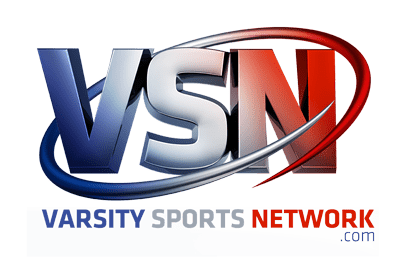 That would be quite an accomplishment for anyone, much less a senior at the Institute of Notre Dame who plays the sport year round for the Penguins’ outdoor and indoor teams in the Interscholastic Athletic Association of Maryland and for the highly regarded Premier club team. 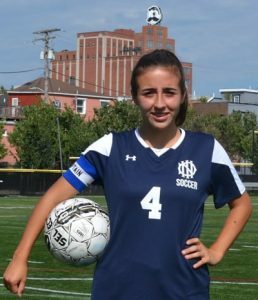 Her dad, Carlos, who hails from a small town north of Lima, coaches both IND soccer squads while Notre Dame Prep varsity coach Val Teixeira guides a Premier team that has won a national championship with Bocanegra playing center midfield. Teixeira said that he has coached the John Hopkins commit since she was 12. The idea of playing for her dad’s native country was originally brought up in an off-handed matter by him until Carlos made some serious inquiries about Emma actually trying out for Peru’s national U-17 side. To that end, Carlos, contacted the Peruvian Football Federation on a whim and received a very quick and positive reply. Her first “tryout” really wasn’t one at all, at least in person. 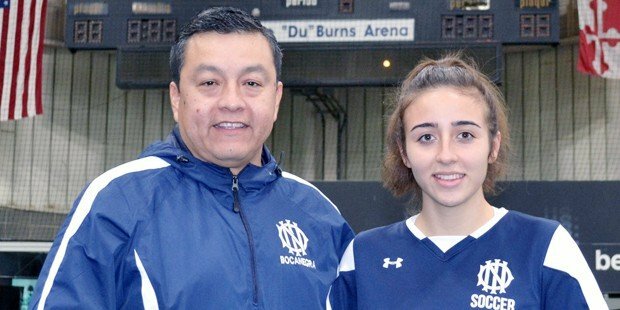 With her Baltimore hometown roots accentuated by the Mr. Boh sign in the background, IND’s Emma Bocanerga is spreading her international wings by playing for her father’s native Peru. Instead, Carlos put together a video of Emma’s highlights when she was playing for the Severna Park Lasers U-17 squad as a 15-year-old standout and sent it to PFF officials. By the time, she did tryout in person for the team, PFF coaches were familiar with her ability on the pitch. As more of a facilitator and a feeder rather than a big-time scorer, the technical aspect of Emma’s game is what makes her such an asset. Moreover, a couple of scouting reports on www.soccerwire.com may have caught PFF coaches’ attention by the way Emma was described in a “Players That Impressed” segment for players from across the U.S. Proving those words to be prophetic, She has earned spots on Peruvian national teams ever since, playing two years for the U-17 team in World Cup qualifying tournaments and one with the U-20 squad. Emma said that she also played for the Peru U-20s in an international friendly tour in Florida playing against Division I teams from Jacksonville University, Stetson and Florida State. She has also been invited back to earn a spot on this year’s U-20 roster at tryouts in Lima Feb. 11-17. Emma said that she has had to make some serious adjustments in order to meld her talent with that of her more free-flowing teammates. The step up to U-20 was an eye-opener. In addition to improving her physical skills, there are language barriers to hurdle for a player for whom English — she was born here — is a her native tongue. She said that she has improved by downloading Spanish-language apps and conversing with her father more often in Spanish. A school community service trip to a part of the Dominican Republic last April where no one spoke English has also helped her Spanish. On the pitch, though, most of what doesn’t come naturally to her is earned through sheer determination. Pictured above: IND senior Emma Bocanegra with her dad and high school coach, Carlos, at Clarence “Du” Burns Arena in Canton after the Penguins handed Roland Park Country School its first IAAM B Conference loss Jan. 9. Emma assisted on the first goal against the Reds and scored the final goal in a 3-2 victory. Carlos coaches both the outdoor and indoor teams at IND and was instrumental in helping Emma toward earning roster berths on three national teams in his native Peru.